Large pannier of time-proven design. 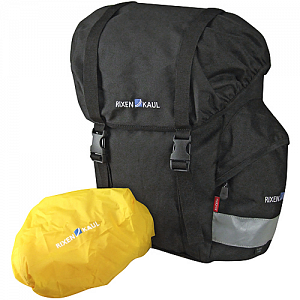 With handle, integrated rain protection, and additional outside compartment with reflector. Inner lid compartment with zipper and little extra pouch for rain cover. High-quality soft polyester with waterproof coating. Includes Universal rail with adjustable hook position for standard carriers Ø 8/10/12mm, 16mm and Kettler carriers. With special GTA hooks for the Universal-rail, you can also use these bags on the carrier adapter or Pletscher Dual carrier. The lower catch prevents the bag from swinging sideways.